This article is about the X-ray telecope ROSAT. For the Roman Catholic bishop, see Adalberto Arturo Rosat. ROSAT (short for Röntgensatellit, in German X-rays are called Röntgenstrahlen, in honour of Wilhelm Röntgen) was a German Aerospace Center-led satellite X-ray telescope, with instruments built by West Germany, the United Kingdom and the United States. 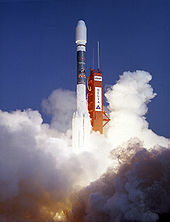 It was launched on 1 June 1990, on a Delta II rocket from Cape Canaveral, on what was initially designed as an 18-month mission, with provision for up to five years of operation. ROSAT actually operated for over eight years, finally shutting down on 12 February 1999. Launch of the ROSAT in Cape Canaveral, Florida. In February 2011, it was reported that the 2,400 kg (5,291 lb) satellite was unlikely to burn up entirely while re-entering the Earth's atmosphere due to the large amount of ceramics and glass used in construction. Parts as heavy as 400 kg (882 lb) could impact the surface intact. ROSAT eventually re-entered the Earth's atmosphere on 23 October 2011 over Bay of Bengal. 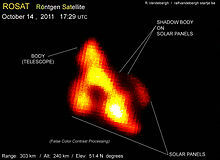 According to NASA, the Roentgensatellit (ROSAT) was a joint German, U.S. and British X-ray astrophysics project. ROSAT carried a German-built imaging X-ray Telescope (XRT) with three focal plane instruments: two German Position Sensitive Proportional Counters (PSPC) and the US-supplied High Resolution Imager (HRI). The X-ray mirror assembly was a grazing incidence four-fold nested Wolter I telescope with an 84-cm diameter aperture and 240-cm focal length. The angular resolution was less than 5 arcsecond at half energy width (the "angle within which half of the electromagnetic radiation" is focused). The XRT assembly was sensitive to X-rays between 0.1 and 2 keV (one thousand Electronvolt). In addition, a British-supplied extreme ultraviolet (XUV) telescope, the Wide Field Camera (WFC), was coaligned with the XRT and covered the energy band from 0.042 to 0.21 keV (30 to 6 nm). ROSAT's unique strengths were high spatial resolution, low-background, soft X-ray imaging for the study of the structure of low surface brightness features, and for low-resolution spectroscopy. The ROSAT spacecraft was a three-axis stabilized satellite which can be used for pointed observations, for slewing between targets, and for performing scanning observations on great circles perpendicular to the plane of the ecliptic. ROSAT was capable of fast slews (180 deg. in ~15 min.) which makes it possible to observe two targets on opposite hemispheres during each orbit. The pointing accuracy was 1 arcminute with stability less than 5 arcsec per sec and jitter radius of ~10 arcsec. Two CCD star sensors were used for optical position sensing of guide stars and attitude determination of the spacecraft. The post facto attitude determination accuracy was 6 arcsec. After a two-month on-orbit calibration and verification period, an all-sky survey was performed for six months using the PSPC in the focus of XRT, and in two XUV bands using the WFC. The survey was carried out in the scan mode. The second phase consists of the remainder of the mission and was devoted to pointed observations of selected astrophysical sources. In ROSAT's pointed phase, observing time was allocated to Guest Investigators from all three participating countries through peer review of submitted proposals. ROSAT had a design life of 18 months, but was expected to operate beyond its nominal lifetime. The main assembly was a German-built imaging X-ray Telescope (XRT) with three focal plane instruments: two German Position Sensitive Proportional Counters (PSPC) and the US-supplied High Resolution Imager (HRI). The X-ray mirror assembly was a grazing incidence four-fold nested Wolter I telescope with an 84 cm (33 in) diameter aperture and 240 cm (94 in) focal length. The angular resolution was less than 5 arcsec at half energy width. The XRT assembly was sensitive to X-rays between 0.1 and 2 keV. Each Position Sensitive Proportional Counter (PSPC) is a thin-window gas counter. Each incoming X-ray photon produces an electron cloud whose position and charge are detected using two wire grids. The photon position is determined with an accuracy of about 120 micrometers. The electron cloud's charge corresponds to the photon energy. The US supplied High Resolution Imager used a crossed grid detector with a position accuracy to 25 micrometers. The instrument was damaged by solar exposure on 20 September 1998. The Wide Field Camera (WFC) was a British-supplied extreme ultraviolet (XUV) telescope co-aligned with the XRT and covered the wave band between 300 and 60 angstroms (0.042 to 0.21 keV). Detection of pulsations from Geminga. 1RXS - an acronym which is the prefix used for the First ROSAT X-ray Survey (1st ROSAT X-ray Survey), a catalogue of astronomical objects visible for ROSAT in the X-ray spectrum. ROSAT was originally planned to be launched on the Space Shuttle but the Challenger disaster caused it to be moved to the Delta platform. This move made it impossible to recapture ROSAT with a Shuttle and bring it back to Earth. Originally designed for a five-year mission, ROSAT continued in its extended mission for a further four years before equipment failure forced an end to the mission. For some months after this, ROSAT completed its very last observations before being finally switched off on 12 February 1999. On 25 April 1998, failure of the primary star tracker on the X-ray Telescope led to pointing errors that in turn had caused solar overheating. A contingency plan and the necessary software had already been developed to utilise an alternative star tracker attached to the Wide Field Camera. ROSAT was soon operational again, but with some restrictions to the effectiveness of its tracking and thus its control. It was severely damaged on 20 September 1998 when a reaction wheel in the spacecraft's Attitude Measuring and Control System (AMCS) reached its maximum rotational speed,[note 1] losing control of a slew, damaging the High Resolution Imager by exposure to the sun. This failure was initially attributed to the difficulties of controlling the satellite under these difficult circumstances outside its initial design parameters. In 2008, NASA investigators were reported to have found that the ROSAT failure was linked to a cyber-intrusion at Goddard Space Flight Center. This was also reported through Bruce Schneier's blog, a highly regarded commentary on IT security issues. "Hostile activities compromised [NASA] computer systems that directly and indirectly deal with the design, testing, and transferring of satellite package command-and-control codes." The advisory is further reported as claiming that the ROSAT incident was "coincident with the intrusion" and that, "Operational characteristics and commanding of the ROSAT were sufficiently similar to other space assets to provide intruders with valuable information about how such platforms are commanded,". Without public access to the advisory, it is obviously impossible to comment in detail. While it does seem to describe a real intrusion, there is a plausible "no attack" explanation for ROSAT's failure, and the report is claimed to link the two incidents as no more than "coincident." IT security remains a significant issue for NASA. Other systems including the Earth Observing System have also been attacked. In 1990, the satellite was put in an orbit at an altitude of 580 km (360 mi) and inclination of 53°. Due to atmospheric drag, the satellite slowly lost height until, in September 2011, the satellite was orbiting approximately 270 km (168 mi) above the Earth. On 23 October 2011 ROSAT re-entered the Earth's atmosphere sometime between 1:45 UTC and 2:15 UTC over the Bay of Bengal, east of India. There was no confirmation if pieces of debris had reached the Earth's surface. ^ A reaction wheel operates by changing its rotational velocity, conservation of angular momentum then causing the more massive satellite to rotate in opposition. Their maximum speed is limited by design, which in turn means they are limited in the rotational velocity they can impart to a satellite. [clarification needed] "Reaching maximum speed" means merely that it cannot impart any more velocity change, not that it's approaching mechanical damage to itself. ^ a b "ROSAT space craft details". nssdc.gsfc.nasa.gov. NASA. Retrieved 23 April 2016. ^ "Drohender Absturz: Problem-Satellit beunruhigt Bundesregierung" (in German). Der Spiegel. Retrieved 26 February 2011. ^ DLR. "ROSAT re-entered atmosphere over Bay of Bengal". DLR Portal. Retrieved 14 July 2018. ^ a b c "Overview of ROSAT". NASA. ^ "Position Sensitive Proportional Counter". ^ "High Resolution Imager (HRI)". ^ "ROSAT completes almost a decade of discovery". UK ROSAT Guest Observer Centre. 18 February 1999. ^ "ROSAT/LEDAS electronic newsletter". ROSAT News No. 60. UK ROSAT Guest Observer Centre (12). 5 June 1998. Archived from the original on 28 December 2015. ^ a b c "Severe Damage to ROSAT High Resolution Imager". star.le.ac.uk. 15 October 1998. Retrieved 23 October 2011. ^ a b c d "Network Security Breaches Plague NASA". Business Week. 20 November 2008. Without warning one day, the ROSAT satellite turned, seemingly inexplicably, toward the sun. The move damaged a critical optical sensor, rendering the satellite useless in its mission of making X-ray and ultraviolet images of deep space. ^ "Cyberattacks Against NASA". Bruce Schneier's blog. 4 December 2008. ^ a b Talleur, Thomas J. (18 January 1999). Russian Domain Attacks Against NASA Network Systems. Not publicly published. Classified as "For Official Use Only—No Foreign Dissemination": Inspector General's office, NASA. 26. ^ "ROSAT - latest news". DLR Portal. 25 October 2011. Retrieved 25 October 2011. ^ "ROSAT Information". Heavens-Above. Retrieved 1 April 2009. ^ "Second big satellite set to resist re-entry burn-up - space - 23 September 2011". New Scientist. Retrieved 30 January 2012. Wikimedia Commons has media related to ROSAT. "ROSAT". German Aerospace Center DLR. "The ROSAT Mission". Max-Planck-Institut für extraterrestrische Physik. "UK ROSAT Guest Observer Centre". University of Leicester, Department of Physics & Astronomy.